Feeling the need for something different in my wardrobe other than my usual suits and being inspired by Etta's fabulous vest suit, I went on a quest for the perfect vest pattern. 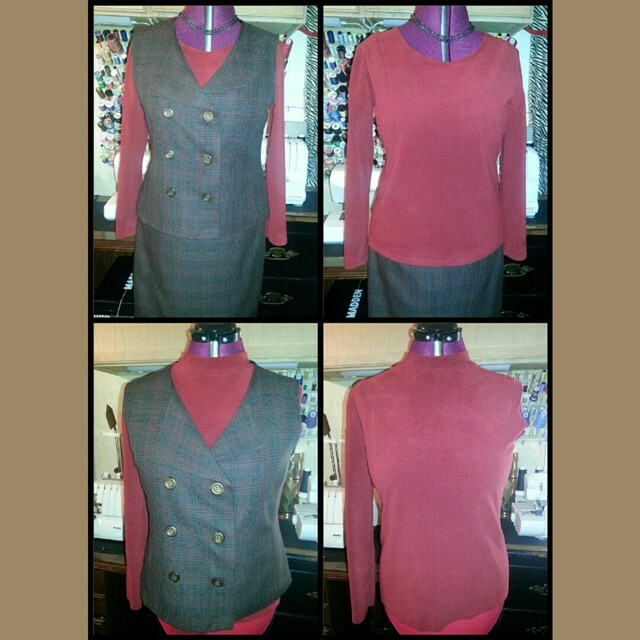 Sifted through my pattern stash and came across Butterick 5958: Vest and Jacket: fitted, lined vest or jacket with princess seams side panels and side front zipper. For Version A, I had the perfect fabric to pair with it, which is a dk. brown, dk. green & burgundy plaid poly suiting fabric, that I'd scored at Virgo fabric last year. The fabric washed & dried like a dream with no need to iron after machine drying. I tried my darnedest to match up the plaid at every seam, but of course there is one seam where the plaid is not aligned. Seriously, this pattern went together effortlessly with very little fitting. Also, I checked patternreview and Valerie's Review gave me a heads up on the cutting length issue. I started off with my usual tissue fit, then used my rtw vest to compare measurements, and basically any tinkering that I did from that point was with the front & back side panels making the fitting process painless. I also added an 1-1/4" inch to the pattern piece lengths. I did partial fusible interfacing for the front & upper back. Fully lined and hand stitch the bottom close. Initially, for the closure I was going with the suggested zipper, but only realized after basting the zipper in that the whole idea of the zipper tape showing was not going to work. Referred to my rtw off-center jackets and noticed that not one of them showed the whole zipper tape. So another closure was needed and after some helpful suggestions, opted for buttons. I think I spent more time worrying over the buttonholes than making the entire ensemble. Seriously. After completing the vest, I came across J. Kaori Sews' on how to enclose an exposed zipper tape and will definitely try it out on the next one. 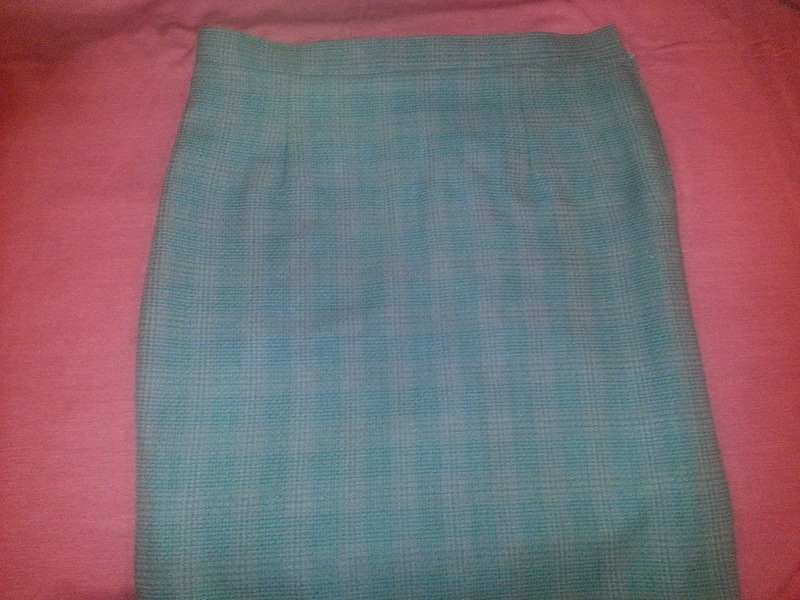 For the matching skirt I used Mccalls 6654: Semi-fitted/loose-fitting skirts with elasticized waist and narrow hem. Mainly used this pattern... well why else, it was handy...lol. However, this pattern calls for knit fabric and since I was using a woven, I added 1" to the front and back, and also added a side zipper. To take up some of the excess ease I added front and back darts and created a waistband as well and fully lined. I wanted to peg the skirt a wee more, but knew in doing so would have be doing the twee step.. a/k/a no walking ease, so that was not going to happen. 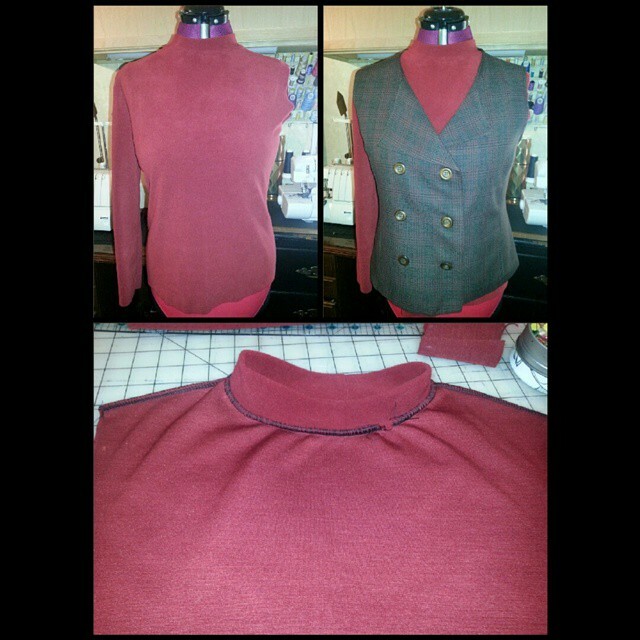 For the top, I wanted something with a warmth factor and used a thin fleece knit from Fulton fabric. The pattern I paired with it is Mccalls 6796:Close-fitting pullover over tops with collar variation and narrow hem. To add to the issues, I wasn't really feeling the turtleneck with the vest. Stepped away from it and returned with a new agenda.. cut that dayumm collar off, scooped a little out of the neckline and all was right with the world again. End result, a fabulously different ensemble in my wardrobe and love it. Pretty classy look. Those darn plaids always leave you hanging at some point or another. Thanks for the link to the zipper insertion tip. The top does look better without the turtle. Thank you Andrea. I am so glad I changed the neckline. Thank you L. It's a definite must add and you will love it. What a great classic set. Love it and am going to add it to my queue. Thx for the inspiration. Love, love your suit. It is classic conservative with a modern flare. Great job and really stylish! Hey Ms. Sheila, I really like this outfit! Good decision on your part to save that top and I agree with you it does look very good this way. I really like turtlenecks too, but have not found a good one yet… Still working on that! Thank you Myra. Since modifying the neckline of M6796, I sewed 2 more tops. Although the original pattern is no longer viable for its initial purpose, I now have a top pattern that I like. I will keep my eye out for another turtleneck pattern too.